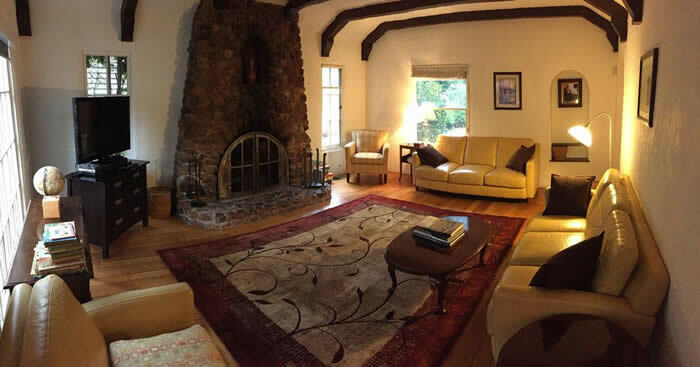 Highland Manor is a large Tudor-style home with a separate cottage and a Pool and Spa that will accommodate a family get together or group retreat of up to 12 people. 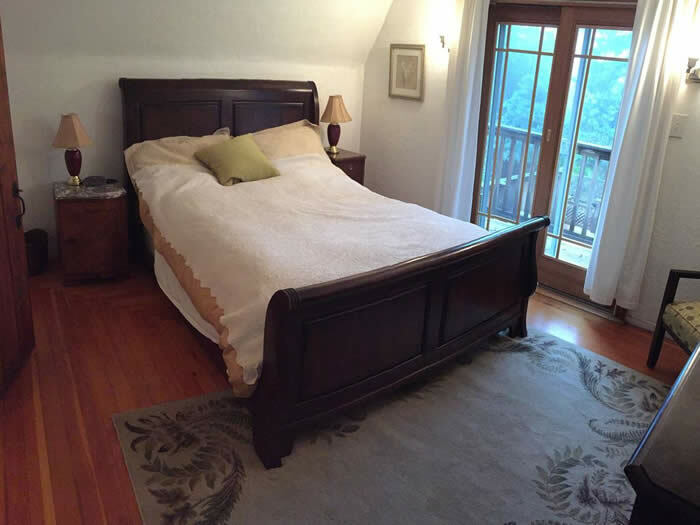 It is nicely furnished for your pleasure and comfort with classic hardwood and tiled floors throughout. 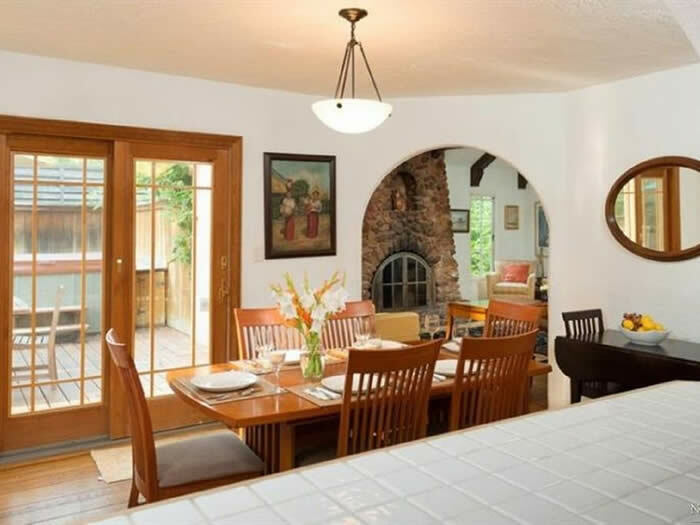 adjacent dining room with seating for 10+. 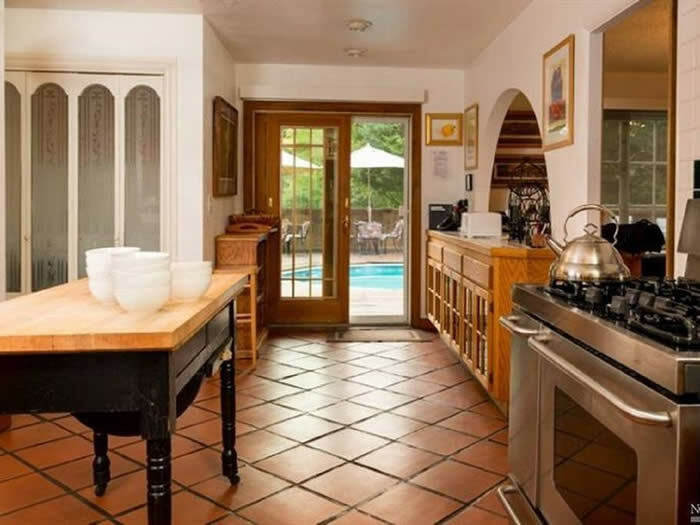 French doors from the kitchen and from the dining room open to the pool deck. 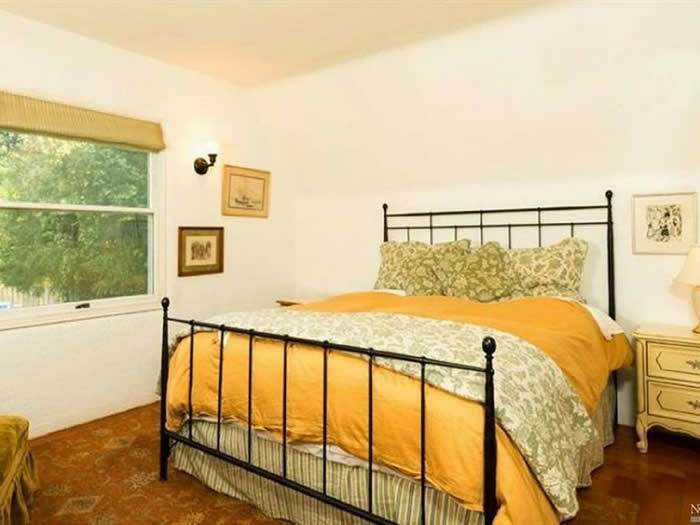 In addition, the ground floor features a queen bedroom and a full bathroom with a shower. 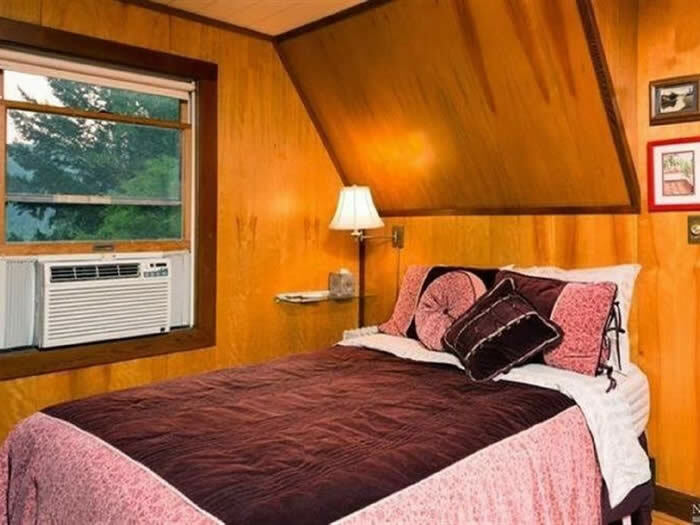 There is also a huge family room with a four twin beds, a futon, and a 46 inch LCD TV with cable and a DVD player: a perfect place for kids and groups to play and sleep. The manor’s upstairs includes three bedrooms, a master bath with a shower, and shared bathroom with a shower and separate bath tub. 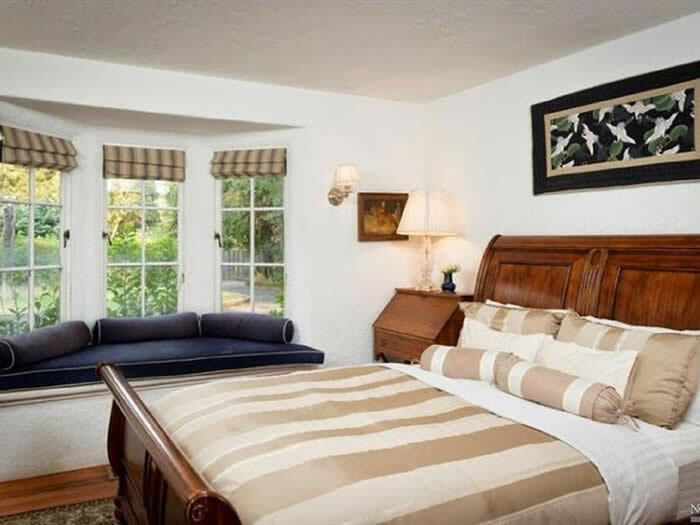 Two bedrooms include queen beds and the third has a king-sized four-poster bed. Upstairs also has access to a balcony overlooking the pool deck. Every window has beautiful garden and/or forest views. 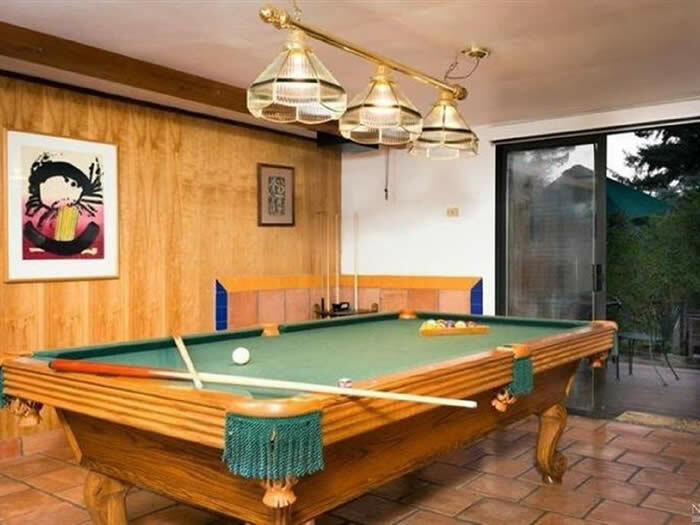 Behind the house is a separate cottage with a tournament pool table downstairs and upstairs has a bedroom with a full bed and an attached full bathroom. 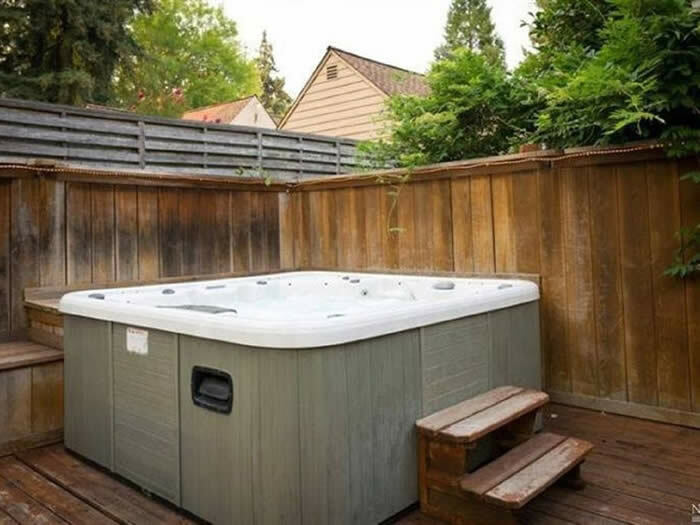 OUTSIDE: The private backyard boasts an in-deck, large heated swimming pool with safety cover. 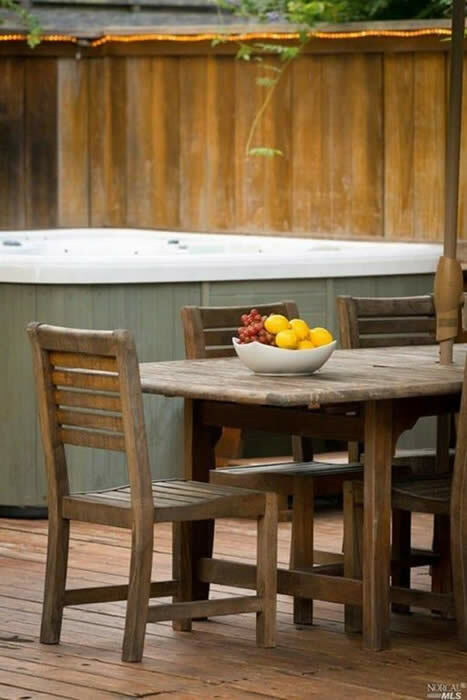 The deck also includes dozens of chairs and loungers bathed in afternoon sunshine, several tables with umbrellas, a large propane grill, and a hot tub for seven. 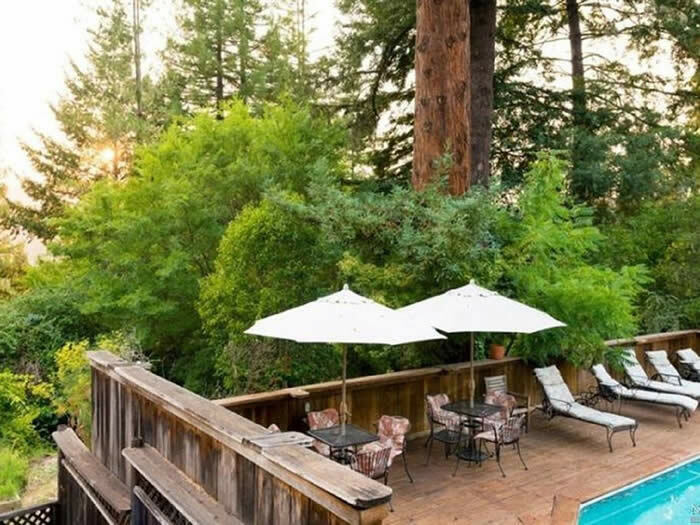 Around the manor is a half-acre of nicely landscaped grounds that include two towering redwood trees, forest views all around, gardens for strolling and relaxing, and a private patio behind the cottage. 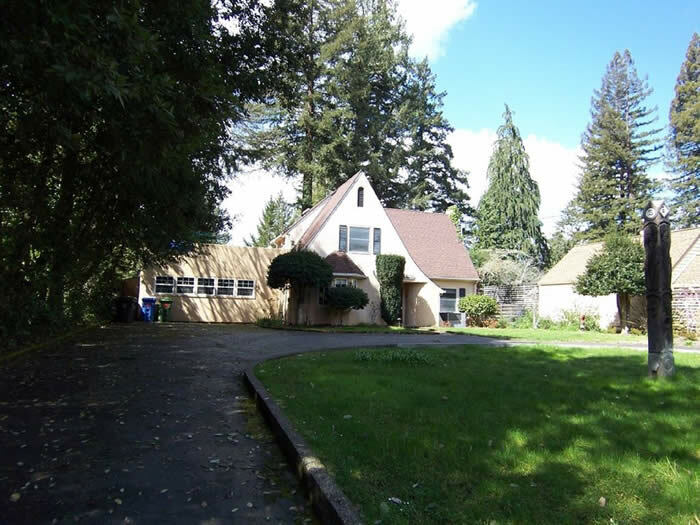 The front yard includes a good-sized lawn for games, a rose garden, and a circular driveway with parking for five cars without being blocked in. 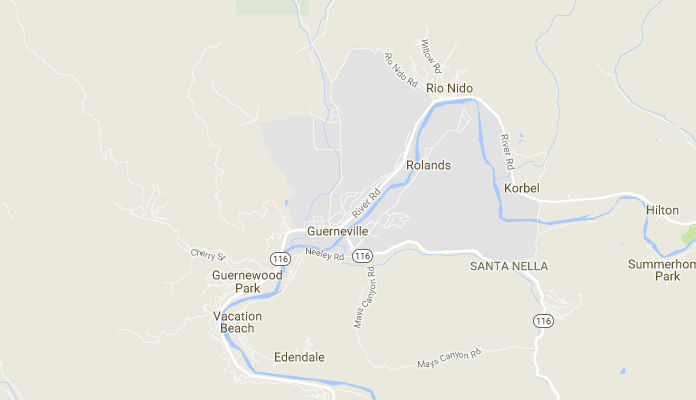 AROUND TOWN: The Manor sits atop a hill on a secluded cul-de-sac in Guerneville's 'Morningside' neighborhood – a private and quiet retreat that is but just minutes from downtown Guerneville. In town you and can enjoy shopping, coffee and dessert shops, and fine dining. At the edge of town you can go swimming, sunbathing, canoeing/paddle-boarding on the Russian River at Johnson’s Beach. 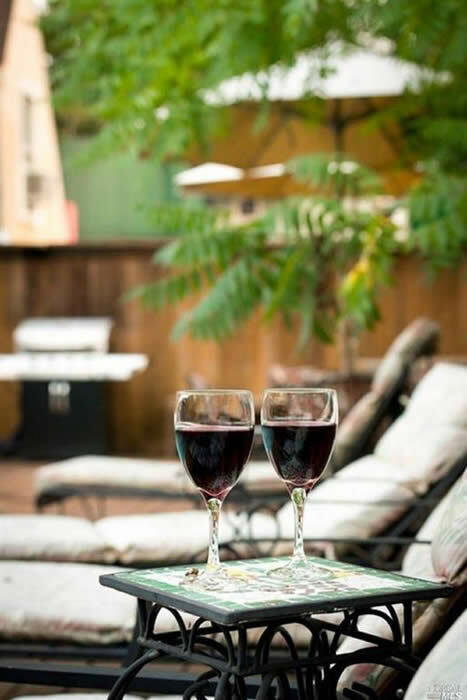 By car, there are scenic redwood hikes within 10 minutes, a spectacular ocean beach within 30 minutes, and hundreds of local, world-class wineries within 45 minutes. 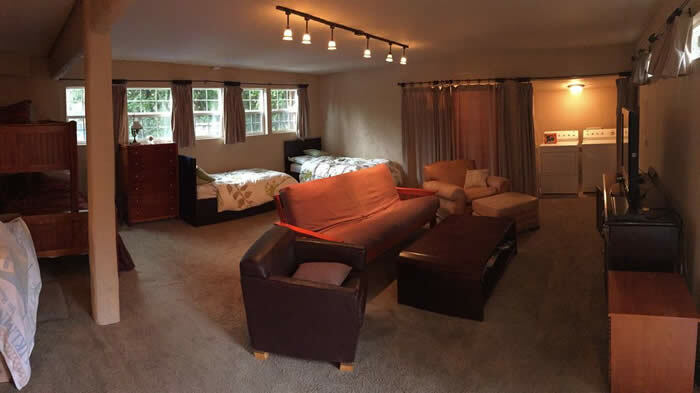 In addition to the 5 bedrooms listed, there is a 575 sq ft family room in the downstairs that contains three twin beds, one double bed and a futon, which can accommodate as many as 5 people all in separate beds or 7 people in shared beds. This room also includes a portable crib / "pack & play". Notes: Pets are acceptable but additional cleaning fees of $50-100 will be withheld from the deposit if extra time is needed to clean up after the pets. Concierge services (picking up groceries, etc.) and catering services are available upon request. This place was awesome. The pictures accurately show what the house is like. It was bigger than I expected and the cottage with its own bathroom was nice. The pool table room is awesome and we enjoyed playing pool and listening to music there. The hot tub was great (seemed brand new) and we couldn't wait to get in each evening. The kitchen was great (nice range/oven). 10/10 would stay again Eric W.
Pictures don't do it justice. Me + 9 girls stayed here recently. It's super cute and we all really enjoyed our stay. It's nice to have the 4 twin beds too in the family room because it just made everyone feel more comfortable. I was worried that the bathrooms would be an issue but we had plenty of room. Having the hot tub was also clutch. Stayed: September 2017 Jessica H.
Great house. Beautiful deck and pool area. Very private. Nice house. Lots of room. Plenty of parking. Narrow streets getting there, but that's common for this area. Clean, comfortable and very accommodating. Quick reply to any questions. Deck area is awesome! Will definitely come back and we only live 30 minutes away. Stayed: June 2017 Viva D.
This house was great, conveniently located and very well organized. We enjoyed our stay a lot! Great house!! Accurate description. Very organized and well located. The owner was very responsive and helpful. Definitely recommended!! We stayed over Christmas with our adult kids and their families. 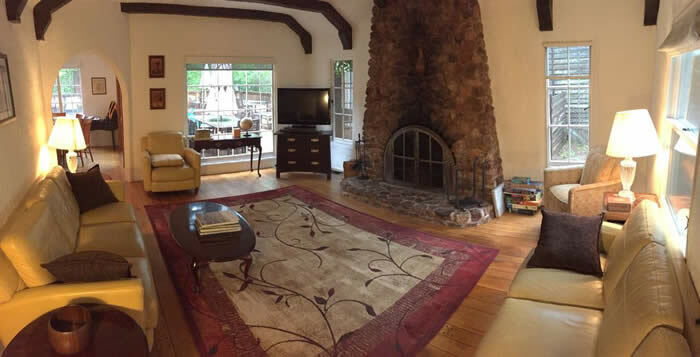 Large lounge with huge fireplace and plenty of sofas and chairs. 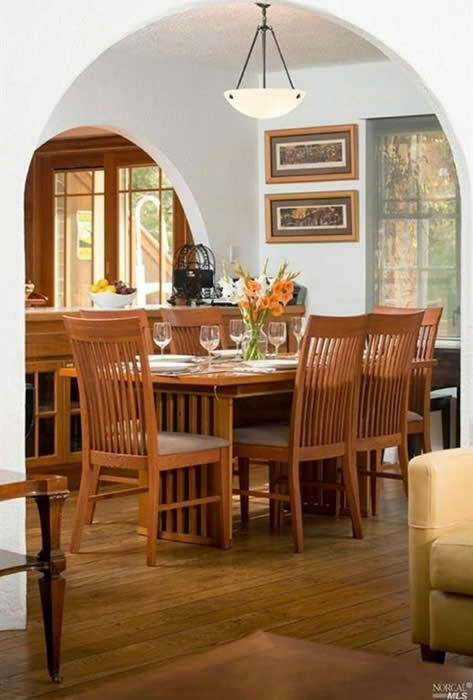 Large dining table, with extensions if needed. The kids enjoyed a large "playroom" that had about seven beds in it. 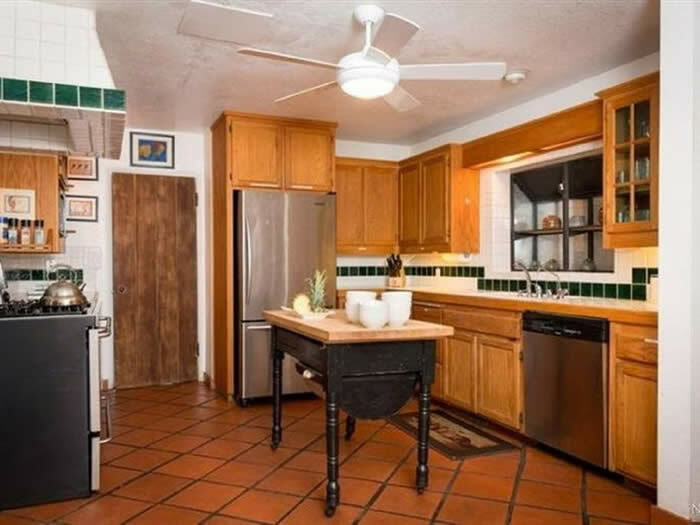 Plenty of countertop space for multiple people cooking, and beds were comfortable in the four adult rooms. There was a cold snap while we were there, but the hot tub was enjoyable. There is also an outside cottage with another bedroom and a pool table. However there is no internet at the cottage, and it was chilly because of the weather. We contacted the manager as there was a problem with the downstairs shower, and a plumber was there (on Christmas Eve) within 20 minutes. She also brought us over an additional heater for the pool table room. However, I would recommend taking photos when you leave. We had completely tidied up after ourselves, yet we were charged an additional fee and were told it took the cleaners two hours to wash dirty dishes that were left out. However, we sent the owner pics of the place as we had left it, and he refunded it without argument. It would have been nice to have a few wine glasses instead of just plastic pool tumblers. Dan B.